It is easy to be distracted by the scale of looting. Yet there are also intellectual consequences as find-spots and contexts are lost or fabricated. What are the implications for the study of ancient trade? I was considering the commercial mark on an Attic black-figured neck-amphora of Panathenaic shape that passed through Sotheby's in London (July 17, 1985, lot 313). The mark falls into Alan Johnston's (Trademarks on Greek Vases: Addenda) Type 25A. There are thirteen examples. Eight of them (all but this one Type B amphorae) are attributed to 'Group E'. Three of the amphorae are said to have been found at Vulci in Etruria (as well as possibly a column-krater now in the Vatican). 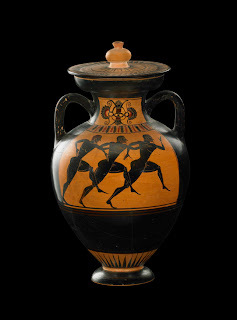 In addition to the amphora of Panathenaic shape, a Type B amphora, also attributed to Group E, passed through Sotheby's in London the year before (July 9-10, 1984, lot 314); it is now in Canberra (84.02). What was the history of the two pieces before they were auctioned at Sotheby's? Where were they found? The commercial mark also appears to be listed as Johnston Type 15A (a not dissimilar mark). Here Sotheby's, July 17, 1985, lot 313 is attributed to the painter of Louvre F6; four of the twelve pots bearing this mark are attributed to this "painter" of which two were said to have been found at Vulci. Could this trademark be an abbreviation of an Etruscan personal name (as Johnston suggests)? Are these two marks evidence for Greek trade? An Etruscan trader? Are they linked to a particular Athenian pottery workshop, perhaps suggesting that the marks were applied to a batch (or batches) of imported pottery? Were they applied at Vulci (or at least in Etruria)? We are unlikely to know as the majority of the find-spots have been lost. The amphora of Panathenaic shape is likely to have been found in Italy. Why do I say that? Photographs of it were found in Geneva, "In the Polaroids, the amphora is broken and dirty with earth." Indeed the amphora was among the antiquities returned to Italy by Shelby White earlier this year. So collecting recently surfaced antiquities does have intellectual consequences.